Maruti Suzuki has recently instigated mild hybrid technology for its cars with the new Ciaz SHVS (Smart Hybrid Vehicle by Suzuki) which arrives almost a year after the original Ciaz made its Indian debut. It goes beyond Mahindra & Mahindra’s outgoing micro hybrid tech and ventures into the relatively-unexplored mild hybrid arena, where the energy is stored and re-used whenever required. In less than a year of existence, Maruti Suzuki Ciaz has become the second most selling mid-size sedan in the country, dethroning the Hyundai Verna. But will the new SHVS or this RS body kit, help the Ciaz to give the segment leader Honda City a run for its money. We tried to find out. The Ciaz SHVS looks exactly like the earlier model, save for the 'SHVS' badging on the lower end of boot. Its understated design continues to impress though this RS body kit seems overbaked. The wide stance and low roof line adds a sense of sportiness to the sedan’s otherwise subtle character. Its front is dominated by a sculptured hood, projectors-incorporated swept-back headlamps and a chrome-dipped radiator grille with a quartet of horizontal slats slapped with a big Suzuki logo. The Ciaz is longer than most of its rivals and that’s easily evident when seen sideways. The most eye-catchy element here is a strong shoulder line that flows from the tip of the taillights to the front fender, traversing its way through the door handles. Also, a couple of sharp creases and an attractive set of anthracite multi-spoke alloys sums up the simple-yet-appealing side profile of the Ciaz. The rear, however, looks too familiar to the closest rival Honda City. But I wouldn’t like to indulge into all that, and summarise it by stating that the rear looks quite agreeable in the overall package. The sedan anyways has a slightly raised boot, and with the spoiler on-board, it looks too high now. The big rear bumper features reflectors in black housings and goes well with the rear design. 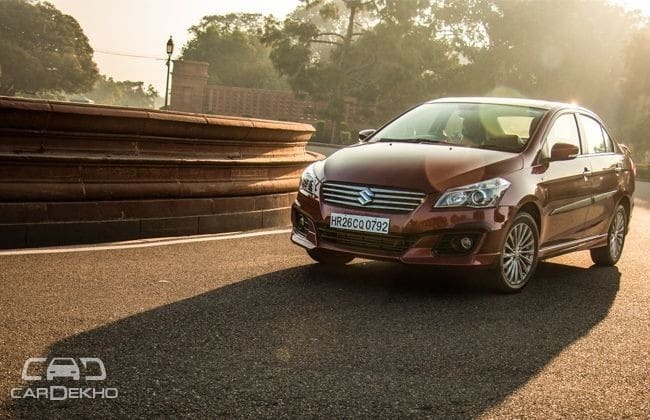 All-inclusive, Ciaz’s design neither offends nor excites. I’ve never been a fan of these so-called ‘sporty’ body kits, thus a Yes for the Ciaz but a No for this RS version. Looks are subjective though. The cabin of the Ciaz is very neatly laid out and reminds you a bit of the Kizashi. The dashboard gets a cultivated waterfall layout housing a new multimedia system including a big touch display through which music, telephone and navigation can be accessed. Overall the setup seems uncluttered, functional, simple, yet appealing. Quite liked it! While the regular Ciaz comes with a beige and black theme, this, the Ciaz RS gets an all-black treatment, which certainly looks a lot sportier than before, compromises on the roomy feel though. Also, the faux wood garnishing on the standard car has now been replaced with a satin silver insert. The instrument cluster also comes with a minor tweak- gets a blue tint around the dials and houses a gear shift indicator. The steering wheel, in fact many other elements are taken from other Maruti cars, which most of the buyers of this segment wouldn’t appreciate for sure. The steering is adjustable just for rake and feels decent to hold. The steering mounted controls are somehow stacked on only one side of the steering - audio functions switches are placed on the left spoke, while the Bluetooth and telephony controls are mounted behind the hub between the left and the bottom spoke, which is definitely not the utmost comfortable position. As mentioned above, the Ciaz, at 4,490 mm, is the longest in the segment and that translates into the best-in-class cabin space. Front seats are well-cushioned and offer ample thigh and back support. Rear legroom is exceptional and the backrest is angled conveniently with decent lower back support. There’s rear AC vents in place as well. So, keeping all this mind, the Ciaz, is undoubtedly the best chauffeur-driven car in the segment. The fit-finish and the quality of materials used inside the cabin is at par with the rivals, if not above. Satin silver and chrome has been used at several places to break the black monotony. Overall, Ciaz’s cabin is a nice place to be in. The Ciaz in this newest avatar with the SHVS upgrade isn’t a typical hybrid like the much expensive Toyota Camry, but comes with a mild hybrid setup(as Maruti Suzuki calls it) housing an ‘integrated starter generator’ and a start-stop system mated to the same 89bhp-1.3-litre diesel mill. Basically, the standard alternator has been replaced with an integrated starter generator that helps the engine to start and shut swiftly yet in a smooth manner, while also enabling some energy regeneration during braking or coasting. The start-stop system triggers as soon as you press the dedicated button placed beside the switch for the parking sensors and fog lamps. This system is somewhat similar to Micro Hybrid tech we’ve been seeing on the Mahindras and many of the high-end cars. It shuts down the engine when you bring the car to a complete halt and deactivates itself when you press the clutch and the engine comes to life again. The energy regeneration function comes into effect whenever you decelerate. The system during that time feeds this regenerated energy back into the high capacity lead acid battery. Then under acceleration, this system adjuncts small amount of power on the move, although this only results in improved fuel efficiency and not better performance. When the engine is off, car’s aircon and audio system works normally till the point battery has power, post that the engine cranks back to life in a bid to keep things running. Yes, the scenario is a bit jerky on the start-up, but still way better than the Mahindra’s Microhybrid. Also, it’s quick enough not to become a headache in traffic. The on-road performance though remains identical with the non-SHVS version. The 1.3-litre Fiat sourced VGT turbo assisted oil burner puts out the same 89bhp of peak power at 4,000 rpm along with 200Nm of max twist produced at 1,750 rpm. The unit, like it has always been, needs some revvs to spool up, but once home, it doesn’t allow you to complain. The Ciaz comes with a rather conventional suspension setup having independent MacPherson struts in the front and a non-independent torsion beam on the other end. The arrangement is sorted for comfort overall and very evident in the way it rides. It's softly sprung, thus remains quite comfortable on slow speeds and regular road undulations. However, going over multiple bumps makes it a bit uncomfortable and bouncy, but overall top marks in terms of occupants comfort. Behind the wheel though the Ciaz lacks that excitement. The steering feels vague and disconnected, despite having good weight. The soft suspension, expectedly, does lead to roll when pushed hard in corners but the grip from the 16-inchers is impressive. All in all, the Ciaz isn’t the best car to hit the twisties with, though it’s not that bad either if it were to encounter one. The ventilated disc brakes at front and drums at the rear offer a decent bite. This was my first experience with the Ciaz and I am thoroughly impressed. If you need a comfortable sedan with decent looks, good space, frugal diesel engine and plethora of features and ofcourse you are not stuck on the Honda City, then the Ciaz, ticks all the boxes. Although the SHVS technology seems more-or-less an attempt to influence some of the City buyers, as our test car showed an average fuel efficiency of almost 20 kmpl, which is quite impressive for a car of this segment and size, but expectedly way off the unrealistic claimed number of 28.09kmpl.